The Holy Ridge 雪山聖稜線 is one of Taiwan’s most famous big hiking trails. It’s a stunning hike along a long ridge line that usually takes about 5 days. It crosses several high peaks, including Taiwan’s second highest, Snow Mountain 雪山 (Xueshan) at 3886 m (12749 ft). The ridge is so long that three full days can easily be spent at over 3,400 m.
My friends and I hiked The Holy Ridge recently in a four day blitz. We achieved this by starting at midnight and hiking in the dark for an hour, then skipping the Snow Mountain Peak. 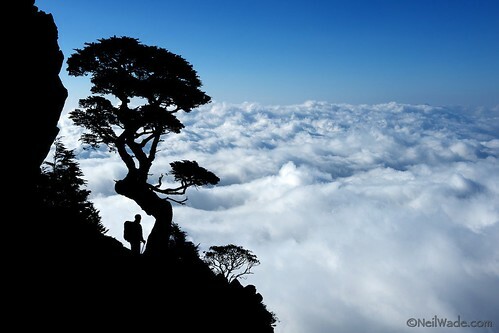 A hiker looks out on a sea of clouds on Taiwan's Holy Ridge, a hiking trail on and around Snow Mountain (Xueshan). Snow Mountain (雪山) is Taiwan’s second highest mountain at 3,886m (12,749ft). Located in Shei-Pa National Park, the most popular trail to the peak is called the East Xue Trail and is quite a beautiful one. The trail passes through a variety of scenery including open grass fields, several different pine forests and a stunning ex-glacial cirque. Despite the fact that I say the following after nearly every hike in Taiwan: This might be one of the best hikes I’ve ever been on! 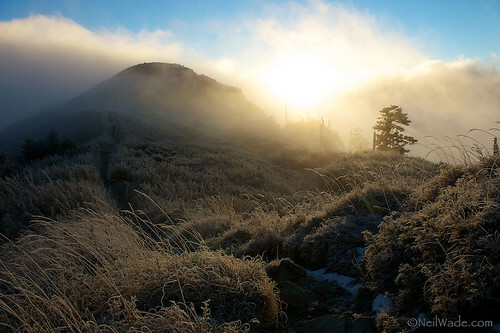 The East Peak of Snow Mountain pokes out of the mist during an early morning sunrise. Jialuo Hu 加羅湖 is a mountain lake found high in the mountains of northern Taiwan. Only 70km southwest of Yilan, the trail head is a three hour drive from Taipei. The hike to the lake takes about another three hours, making this an awesome weekend away from Taipei’s bright lights. 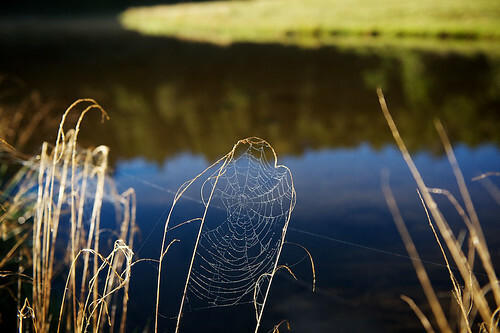 A dream catcher-like spider web reflects the morning sun on Jialuo Hu Lake, near Yilan, Taiwan. Jade Mountain (玉山) is Taiwan’s tallest mountain at 3,952 m (12,966 ft). It’s located within the Yushan National Park (玉山國家公園) just next to the famous Alishan National Scenic Area (阿里山國家風景區) in the central mountains of Taiwan. If measured from the nearby ocean floor, the Jade Mountain Main Peak rises an impressive 8,000 m in only 100 km. Getting a permit to hike Jade Mountain is no easy task. My friends an I applied 14 times before finally receiving a permit to hike it on a weekend (A big thanks to Stu Dawson for his tenacity). We received a second round of good luck by getting perfect hiking weather on the 4th of July weekend. The trail to the peak is beautiful, and this hike is an absolute must-do for anyone with an adventurous soul living in Taiwan. The Jade Mountain Main Peak as seen from the West Peak hiking trail. The mountains of central Taiwan are remote and beautiful. Some friends and I recently made a two day hiking trip to the old NengGao Historic Trail 能高越嶺古道. Starting near Puli 埔里, Taiwan, the Nenggao hiking trail is a long but relatively easy ascent to the “Spine of Taiwan”… the high mountain “Backbone” that runs north to south through its center. Most of our trek was cool (perfect for hiking) and foggy (not so perfect for seeing the nice views), but we had a good time and saw some interesting things, so I thought I’d share. 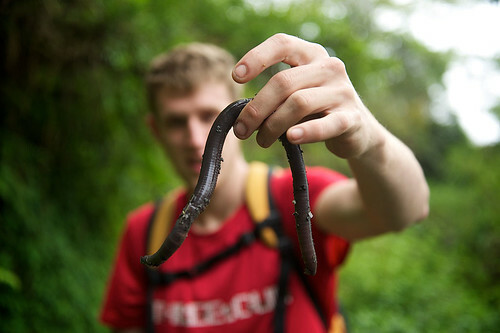 A hiker in the Central Taiwan mountains finds a giant earthworm. My good friend Bryan Lathrop finally got a website up. He’s a freelance photographer in Philadelphia shooting all kinds of different stuff. Check the “Things” gallery for some real cool “Painting with Light”-type still lives. This is a technique I’ve been meaning to write a post about but I’ve been having trouble fining the equipment I need in Taiwan… Soon though… soon. Cool Iris is a great add on to Firefox. (I’m not sure if it works with other browsers) It a much faster and cleaner way to view multiple photos on flickr or facebook or most sites that have a lot of photos. I found that I needed to change the settings a little to keep myself from getting sick as I scrolled through (you’ll see), but it’s definitely cool. Anther great add-on I found for Firefox is Autopager. It automatically loads the next page when surfing many sites with all those numbered pages at the bottom. It also works great with flickr and similar websites and saves a lot of time. Here’s just an awesome photo of a volcano erupting. From the “Fake Human Being Files” comes a fake woman. It’s just an example that portraits are so easy to take now that you don’t even need a subject… or flashes… or a camera. Want to go to college for photography? PhotographyColleges.org has all the info you’ll need on choosing the right one. And lastly is the most comprehensively written article on choosing photo equipment that I’ve ever read. Alexandre Buisse wrote an article for The Luminous Landscape about the photography equipment he chooses to take mountain climbing and why. I know most of you aren’t going to go on a big mountain expedition anytime soon, but reading this article is a reminder of the thought that sometimes needs to go into choosing photography gear. Whether it’s for a big mountain adventure or a walk down the street… And it’s also a reminder that you don’t need all that flashy-super-expensive equipment!!! Formosa Adventurers – 4 Day Trip!!! Formosa Adventurers just got back from our 4 day trip to promote Taiwan. We had an absolutely fantastic time and it will be one of those events in my life that I’ll always look back at and smile about. In four days we went river tracing, white water rafting, 4-wheeling, paragliding, hot springing, local food eating, and we also learned a lot about the aboriginal culture here in Taiwan. There’s nothing like a fun trip with your friends… you should plan one now and make some videos like we did… seriously! These are the things we do on many weekends, but the fact that we were doing it to try to win a contest gave us a bit of extra “umpf” and made it really special. JiaLou Hu 加羅湖 is a mountain lake tucked high in one of Taiwan’s beautiful clouded forests. If you can get to the trail head, it’s a moderate three hour hike to the lake. On the way, you pass through some spectacular forests scattered with luscious green ferns, mossy vines, and a few 1,000 year old trees. Three friends and I went there during the four day “Dragon Boat” holiday in late May. We did it in two days, but there is plenty more to explore in the area, and most of the people we met there were staying for the whole weekend. I took this opportunity to give my first shot at a multi-media presentation. I would really, really like to get some critiques and feedback on what you think of it, so please feel free to comment below. Elephant Mountain (象山) is the most famous of the “Four Beasts Mountains (四獸山)” of Taipei, Taiwan and the most easily accessible. It’s the third and last article in my series about hiking the Four Beasts Mountains. Part one is on 9-5 Peak (Jiuwufeng – 九五峯), and part two is on Tiger Mountain (虎山). Elephant Mountain is the most popular of the mountains for a good reason. Being the closest to the city not only means easy access, but it means stunning views of Taipei, especially Taipei 101. Tiger Mountain(虎山) is the second subject of three in this series of articles on hiking Taipei, Taiwan’s Four Beasts Mountains (四獸山). Tiger Mountain is the most northern of the Four Beasts Mountains and the easiest to get to. It’s not the easiest to find (that would be Elephant Mountain) but if you have transportation, it’s an easy walk along a well kept, level trail. All along the trail are stunning views of Taipei 101, Taipei City, and Nangang. "Taiwan's Tower of Babel" Viewed from Tiger Mountain. Hiking Huang Di Dian 皇帝殿 this past weekend was one of the best day trips I’ve been on in Taiwan. Just about 20 minutes from Taipei, this hike is one that shouldn’t be missed. A perfect 360 view awaited us at the end. Hiking in Taiwan just might be the best thing that you can do here. Fresh air, beautiful views, and a bit of exercise can really help you to forget the traffic, noise and pollution of the cities. I find it really sad that a lot of the people who live here never leave the cities. I’ve met foreigners who have lived here for years and have literally never left the city once. Personally, I go crazy if I can’t get out of Taipei at least every other weekend. Sometimes, I head to the mountains, sometimes the beach, sometimes the hot springs. Last weekend, my friends and I decided that a little hiking was in order. 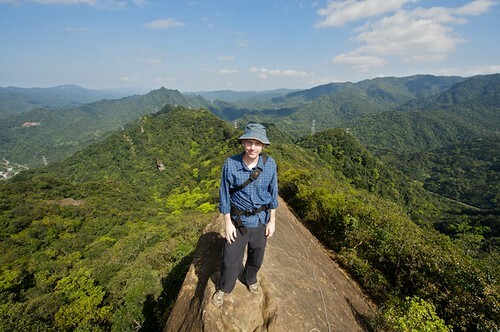 Stu Dawson is completely insane about hiking and has started a website called Hiking Taiwan. He knows his stuff, so if he has a hike planned, I’ll usually try to tag along. Last weekend we headed out to a small town called Pingxi 坪溪, just 30 minutes from Taipei. 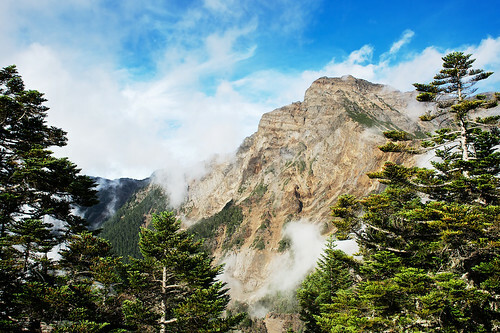 Surrounding Pingxi 坪溪 are some beautiful, jagged mountains that are perfect for a days get away. We chose one called Feng Tou Jian 峰頭尖 that sits on a complex system of trails that crisscross Taiwan. I’ll keep the story short because Stu did a great job of writing about it on his website. 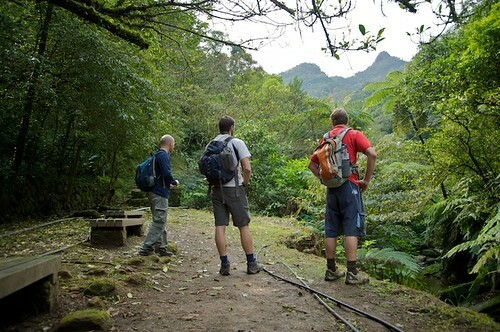 So if you want the details and practicalities of going to this particular trail, go to his site. I just thought I’d share my pictures from the hike to hopefully motivate some of you to get out there and start enjoying yourself! In the beginning, we could see two of the peaks we would cross.